Thu., Nov. 30, 2017, 5:10 p.m.
After six games and two weeks on the road, Bogdan Bliznyuk could be excused for feeling a bit fatigued. Except that he wasn’t. Honest. “I feel good – coach gave us a couple of days off,” the Eastern Washington forward said after Tuesday’s practice at Reese Court. “Now we just need to win some more games,” Bliznyuk said. The Eagles will get their chance soon enough. The next trip – four games in 10 days – begins Sunday at Seattle University with an intriguing matchup with former Eastern coach Jim Hayford. In effect, the Eagles (3-4) are in the middle of a six-day homestand, even if they’re only playing against each other. They’re also watching film, trying to get better while sorting out the highs and lows of the road trip. Those included a 79-69 loss at Washington and an epic win at Stanford, but also one-sided losses to UNLV and Georgia State. The journey ended in frantic fashion. The Eagles enjoyed a Thanksgiving Eve romp over Eastern Kentucky in Las Vegas. Two days later, the Eagles were still digesting their giblets when they absorbed an 85-69 loss at Utah. By that time, the Eagles were “mentally fatigued,” first-year coach Shantay Legans said. “A lot of our shots were falling short,” Legans said. Apart from some spotty outside shooting, Legans liked what he saw. 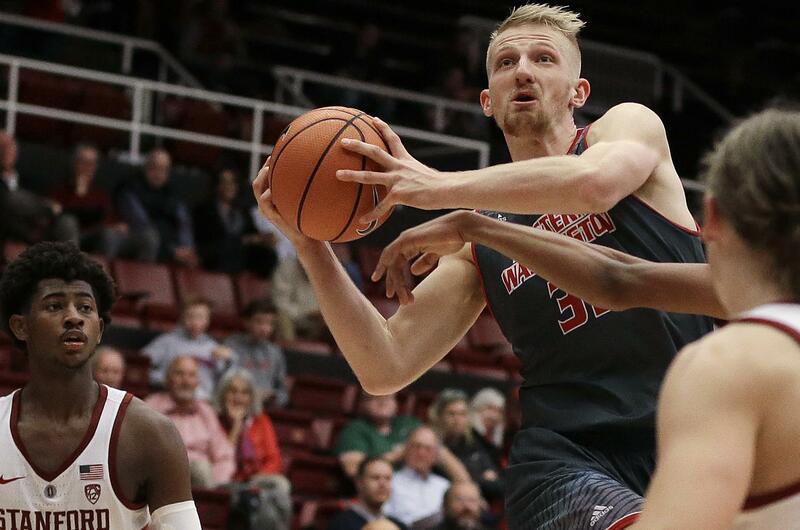 Bliznyuk is living up to his preseason billing while averaging 15.6 points and 4.9 rebounds, and freshman guard Jacob Davison (9.2 ppg) is shooting almost 40 percent from long range. “He’s really attacking his role,” Legans said of Davison. More important, Legans said, the Eagles are defending well. “Our shooting will come around,” he said. “We just need to bring some consistent energy and focus,” guard Ty Gibson said. The Eagles’ focus will be tested Sunday in the Puget Sound area, where Bliznyuk and Gibson grew up and were recruited to Cheney by Hayford and Legans. While he still keeps a house in Spokane and visits monthly, Hayford is immersed in another rebuilding project at Seattle. The Redhawks were 3-4 going into a home game Thursday night against Kennesaw State. “There are some days I forget how hard that was,” Hayford said as he recalled making the move from Whitworth to Eastern in 2011. “I feel that my time at Eastern really helped me. “I learned a lot from (athletic director Bill Chaves’) great leadership, and how to do a lot with a little,” said Hayford, who along with Legans led the Eagles to an NCAA Tournament berth in 2014-15. “And I know that Shantay is going to do well,” Hayford said. Published: Nov. 30, 2017, 5:10 p.m.